Perioral dermatitis is really just an inflammatory condition of the skin which results in redness, rash and papule like eruptions. The term "peri" means next to and the word "oral" means the mouth. So if we break apart the word it literally means a skin rash that is around the mouth. Don't let this fool you, though! Just because the name says it has to be around the mouth doesn't mean it always is. In fact most cases of perioral dermatitis tend to be around the eyes and nose as well as the mouth. Perioral dermatitis is classified into a larger group of skin disorders known as dermatitis, but it should really be considered its own group because of how different it is. Dermatitis is a waste basket term which is used to describe ANY skin conditions which results in inflammation. Because dermatitis is caused by inflammation the treatment is often the use of steroids which act as anti-inflammatory agents on the skin. This works out great for regular dermatitis but can actually make perioral dermatitis even worse. It is estimated that about 0.5 to 1% of the population will suffer from this skin condition which makes it actually quite common. And the majority of those people who develop this condition tend to be young (children) or women! But despite the fact that it is very common Doctors really don't understand the disease that well and there aren't many therapies or treatments. In fact, because not many doctors understand the condition they may actually make it worse by prescribing ointments such as steroids which are known to make the disease worse. 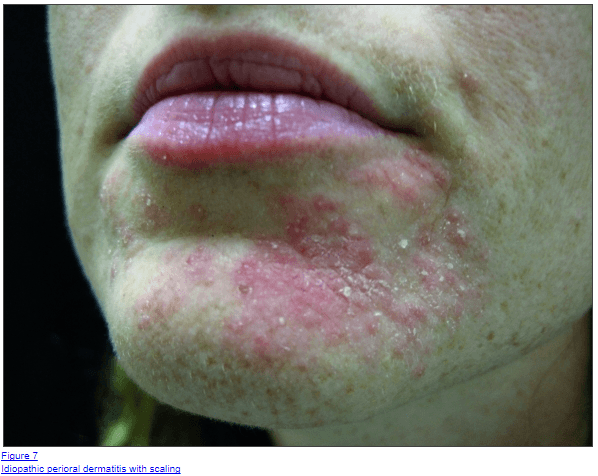 So why is perioral dermatitis so difficult to treat? Part of the reason has to do with the fact that we don't understand exactly what causes the condition. We do understand that there are some potential things that tend to "trigger" the disease. And these are very important because if we understand how the disease state is triggered then we can actively avoid those triggers! It has also been suggested that perioral dermatitis results from an imbalance in bacterial concentrations or damage to the acid mantle on the surface of your skin. As this imbalance occurs your body responds with the inflammatory process known as perioral dermatitis. This theory exists because, at least in some individuals, antibiotics and even probiotics have been shown to be effective in treating the disease. Most of the time we don't actually know which means it is termed "idiopathic"
They key here is to KNOW and understand the triggers of perioral dermatitis. If you understand the triggers then you can actively avoid them. The reason this is so important is because it's VERY tempting to use skin products such as steroids because they can temporarily reduce the symptoms of perioral dermatitis but you have to consider that often steroids make the problem worse. This often leads to an exacerbation of symptoms on the skin once people stop using topical steroids, but it's a necessary step! The #1 most important part of treating perioral dermatitis is to stop using pretty much ANYTHING on your face that isn't necessary. This includes make-up, topical steroids and other cosmetics that you may use. Even moisturizers may contain chemicals or other ingredients that can flare up your symptoms. I know it's tempting to want to put something on it, but this is really a condition where less is more. The best thing you can do for your face is let it heal naturally and over time (there are some things you can use which we will talk about later). Most skin regimens include multiple products such as cleansers, toners and moisturizers. The general advice is to use all of these steps to help your skin and under normal conditions this would be true - but it isn't for perioral dermatitis. When treating this condition make sure you use ONLY a gentle cleanser - and I mean gentle. You want your cleanser to have as few inactive ingredients and chemicals as possible. You also want to make sure that your cleanser is something that you KNOW you will tolerate, hopefully something you've used in the past with success. The goal of using a cleanser is to help naturally exfoliate your epidermis but without overdoing it. It is thought that perioral dermatitis is probably triggered by changes to the bacteria concentrations on your skin and probably in your intestines. We already know that what happens INSIDE of your body will alter what happens on the outside, so it may be helpful to think about perioral dermatitis in a similar way. If you start looking around the internet you will find that some of the most common treatments for perioral dermatitis include natural products such as apple cider vinegar and sometimes the use of antibiotics. Why do you think these therapies are helpful? Some doctors think that antibiotics help to regulate bacterial concentrations on the skin which helps treat the disease. We also know that apple cider vinegar has potent anti-fungal and anti-bacterial effects - meaning it may act as a "topical antibiotic" for your skin. Does this mean you should run out and use antibiotics? A better approach may be to focus on naturally bringing back healthy bacterial levels in your gut and on your skin with the use of probiotics and fermented foods. This is a more natural way to regulate your skin as opposed to trying to kill everything off. In fact, sometimes antibiotics can make perioral dermatitis WORSE. When using probiotics make sure you find a high quality probiotic with at least 100 billion CFU per serving and one that contains both bifidobacteria and lactobacillus species. Using probiotics daily for 3-6 months during your treatment should work well and in some individuals is all they need to fix the problem. So what about fermented foods? You can think about fermented foods as natural sources of probiotics. The fermentation process actually creates an abundance of natural yeasts and bacteria that you then eat. Fermented foods include products like kefir, kimchi, sauerkraut and natto. Adding even a little bit of fermented foods to your diet can do wonders for your gut health AND for your skin! If you are tempted to use ANY products at all then it's best to use organic based products such as apple cider vinegar. Apple cider vinegar (ACV) for short is one of the few things that may actually help treat perioral dermatitis. ACV probably works by improving bacterial levels on the skin, killing off bad bacteria, by improving your acid mantle and by adding a little bit of exfoliation to your skin. One of the potential downsides of using ACV is that it can be a powerful acid that you are placing on your skin. Persistent use of ACV may actually cause redness and irritation of the skin and may make perioral dermatitis worse (if used excessively). The best way to use ACV is to apply it to a cotton swab and then dab in on your face (try to avoid swirling or rubbing) and only on the areas with dermatitis. Do this once per day and see how you tolerate it, if you do okay then you can move to daily application. If you start getting more redness and more irritation then back off and don't use it because it may make your condition worse! You'll want to get an organic version of ACV which includes "the mother" because this tends to have more helpful bacteria. Another way to treat perioral dermatitis is to use topical probiotic creams and gels. You probably are well aware of probiotics that you can consume through pills or powders, but you may not realize that you can also use probiotics by applying them directly to your skin. This may sound funny until you realize that your skin is a HUGE organ (in fact the largest on your body) and it has a bacterial ecosystem JUST like your gut. Just like taking too many oral antibiotics (meaning by mouth) can damage your gut and cause constipation, yeast infections and so on, using topical antibiotics can do the SAME thing for your skin. In fact we've discussed previously that one of the triggers of perioral dermatitis may be a change in bacterial skin concentrations and damage to the acid mantle. You can fight this process by DIRECTLY applying probiotics right to your skin (which has many health benefits). In order to do this you need to use specific products, though. Don't think that just using a probiotic powder on your skin will work - it won't be absorbed into your skin! It has to be in the right formulation. So with this in mind some people may find success using certain creams that contain beneficial probiotics such as lactobacillus species. You don't have to jump into using topical probiotics right away - in fact you might save this as an option for later if the other more basic therapies don't work. Another consideration is the use of topical or oral antibiotics. Now this is one of the therapies (and only therapies) that your Doctor may try to prescribe to you during treatment. Most of the time Doctors will see you and may recommend steroids (make sure you avoid this at all costs!). But occasionally some Doctors may recommend either topical or oral antibiotics. Antibiotics tend to be hit or miss in terms of how effective they are for certain people. Part of this probably has to do with the fact that we really don't understand what causes perioral dermatitis, so if your issue wasn't related to bacterial levels then it probably won't help. So how do you know if you should use it? It's probably a good idea to seek out a dermatologist if you aren't seeing results with more natural therapies over 6 months or so. Another thing that you will want to COMPLETELY avoid is the use of any cosmetic procedure which may cause extra damage to your skin. Procedures that fit into this category include microdermabrasion, chemical peels, laser therapy and so on. The way that these therapies work is by DAMAGING the skin and initiating the healing response which rejuvenates the skin and helps reverse the aging process. This is great if your skin is currently healthy but it can make perioral dermatitis WORSE because it falls into the "trauma" category. So during the healing stage make sure that you avoid the use of any cosmetic procedure such as these. It is probably okay to ease back into these procedures once you have completely healed but make sure to give your skin a long break before you add back powerful treatments. Part of the problem in treating perioral dermatitis comes from the fact that most physicians aren't comfortable with treating it (except dermatologists). The standard treatment for people who walk into a Doctors office with a rash is for the Doctor to prescribe a steroid. This will work about 99% of the time which is why they do it. But in the case of perioral dermatitis this is the absolute wrong choice. The use of steroids may temporarily suppress the inflammation but it will ALWAYS come back and it only makes it worse over time. For this reason you have to avoid topical steroids 100%. If you are using steroids to "block" the rash then you have to stop using them and allow it to "flare" before you can start healing. You can expect your dermatitis to flare after you stop using topical steroids for a short period of time and it may seem worse, but this is the only way to heal. Persistent and chronic use of topical steroids can actually cause serious problems including atrophy and premature aging of your skin - so this isn't a long term solution anyway. You'll find that most primary care physicians probably do not know how to treat perioral dermatitis, so you may have to get a referral to a Dermatologist in order to get proper treatment. Once you head to a dermatologist they will almost always pull you off of the steroid and maybe put you on antibiotics. You can cut out the middle man by simply discontinuing your topical steroids first. If you are serious about getting rid of your dermatitis then you HAVE to stop the steroids. And realize that in some individuals the use of steroids is enough to TRIGGER this type of dermatitis. How long before it goes away? 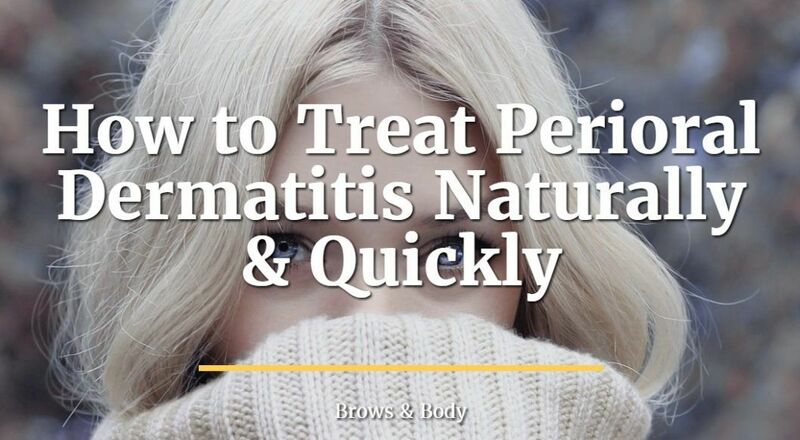 When treating perioral dermatitis you need to set your expectations up early and part of this has to do with how long you need to undergo treatment and how patient you need to be. It's worth noting that treating perioral dermatitis is like a marathon NOT a sprint. This means that you need to have patience and you need to stick to your regimen and trust in the process. There really aren't any quick tricks that you can take advantage of to get rid of your dermatitis in just a few short days. Instead you need to be in it for the long game and be ready and willing to wait weeks to months. Is it true that some people can "cure" their disease within a few days? And the length of treatment time probably depends on the cause or trigger in your body. So if you've been using steroid creams for months then you can't realistically expect your dermatitis to fade in a matter of a few days. When I was treating my perioral dermatitis it took a good 3-4 months for it to heal about 98% and it completely faded by 6 months. The first 1-2 months I only saw about a 5-10% improvement and then by 3-4 months there was a HUGE reduction in symptoms. Your healing process may follow a similar trend. In addition to the therapies and tips listed above you will also want to follow a couple of other guidelines which may help you get on the right track. Remember that perioral dermatitis may be triggered by things that are going on INSIDE of your body as well as those on the outside. Because of this you should take all reasonable steps to improve what you put INTO your body to help the healing process. During the healing process I recommend that you focus on eating all organic products, PLENTY of fruits and vegetables and cut back on the sugar. All of these will help improve your gut function and reduce inflammation in your body. Next you need to be sure that you are staying adequately hydrated! Hydration helps improve the quality and texture of your skin and helps you eliminate toxins. Remember your body only has 4 ways to eliminate toxins: urination, stool, breath and sweat. You want to make sure that you MAXIMIZE all of these! Focus on drinking up to 1 gallon per day. Last on the list is sun exposure and this may be another big one. During the healing process it's probably safer to avoid the sun as much as possible to avoid any extra damage to your skin. In some diseases (such as psoriasis) sun exposure may be therapeutic, but there isn't enough information to say whether or not it's helpful in perioral dermatitis. Because of this it's probably safer to simply avoid direct sunlight for prolonged periods of time to your face. If you simply avoid the sun you can then also avoid the use of daily sunscreen which may just irritate your skin as well. What should you do if nothing else is working? In my experience many people are completely able to "cure" themselves simply by following the steps above, but not everyone will be comfortable with this idea. If you are one of those people or if you haven't had any results despite doing the therapies listed above for 6 months straight it may be time to see a dermatologist. Try to avoid going to see a family practice doctor though! Chances are high that they won't know how to treat you and may set you back by giving you steroids or other ineffective facial creams. Perioral dermatitis is a strange and unique form of dermatitis which primarily affects women and children and can be seriously damaging to self esteem due to how difficult it is to treat. The best way to treat perioral dermatitis may simply be to leave your skin alone and let it heal naturally! For some people, however, you can also use natural and gentle skin based products which act to improve bacterial concentrations on the skin and inside your body. Are you suffering from perioral dermatitis? Have you been able to reduce the appearance of your rash?